NOW ACCEPTING APPLICATIONS FOR WINTER SEASON 2018/19! At Bear Valley Resort we are looking to build our team with a collection of passionate individuals that recognize and truly appreciate the incredible privilege of calling the Sierra home! Our goal is to enrich our organization with unique and self-motivated individuals that are ready to bring their independent thoughts, initiative and action to achieve a common goal of inspiring people that visit Bear Valley to fully immerse in our special brand of Nature! We believe the key to our success in providing a signature experience is a dynamic, fun loving, cohesive and collaborative team that understands that at the center of our mission is a goal to deepen our own, and our guests’ appreciation for the Sierra Nevada and serve as a catalyst for the enjoyment, exploration and discovery of the naturally magnificent Bear Valley and surrounding area. We are looking for smart individuals who are passionate to join us and become part of a team that is in the business of creating fun memories that last a lifetime. In addition, to be a GREAT FIT FOR BEAR VALLEY one must become ENERGIZED by cross-training, diverse skill sets development and collaborating across the organization where ever needed to serve our guests. Find your future at Bear Valley. How do I go about being considered to join the BV Team? Once you review open positions, apply above for an open position, and submit a resume (preferred) you are on your way! Apply for one or more positions you are most interested in and are the best fit for your skill sets and personality. Your application is reviewed by Human Resources and the respective department managers. If there's a strong fit for their department, managers will contact you to schedule a phone, skype or in person interview. Once I have a job offer, what other requirements are there before joining the BV team? A form of identification that establishes both identity and employment eligibility (current U.S. Passport, Permanent Resident Card, International Passport with appropriate work visa, etc.). A current form of identification that establishes your identity (Driver’s License, School ID, etc) AND a form of identification that establishes your employment eligibility (Social Security Card, Birth Certificate, etc). If you are under the age of 18, you will need to secure a work permit; start with your school admin office. If you are going to be driving a company vehicle, you must provide us with a recent Motor Vehicle Record. What do I need to wear as a BV employee? Bear Valley will equip you with a uniform appropriate for your position. If you are working in an inside position, we will provide you with T-shirts, a vest and hat. You will need your own appropriate footwear and pants that are appropriately sized and without holes. Outside positions will be outfitted with t-shirts, outerwear (snow pants, a soft shell jacket, outer shell jacket, and beanie) and hat. You will need to provide your own warm, waterproof gloves, lined, waterproof boots with good grip, eye protection (goggles and/or sunglasses), socks, and long underwear. All employees are issued a name tag and are required to wear their name tag while working. If you are working in a position that requires that you ski/snowboard (i.e. – instructors, lift operations, patrol, etc), you must have your own equipment. Employees receive a 25% discount on gear and 50% off Helmets from Reba Sports. We do provide free safety checks for employees required to ski/snowboard as a part of their job, and 50% off repair work in the Repair Shop. All uniform pieces, other than t-shirts and hats, must be returned to your department manager at the end of your employment. If you don’t have your own vehicle, or want to save on gas, Bear Valley provides a free employee shuttle that starts in Murphys and runs daily during winter operations. How often will I be paid? Does BV offer direct deposit? 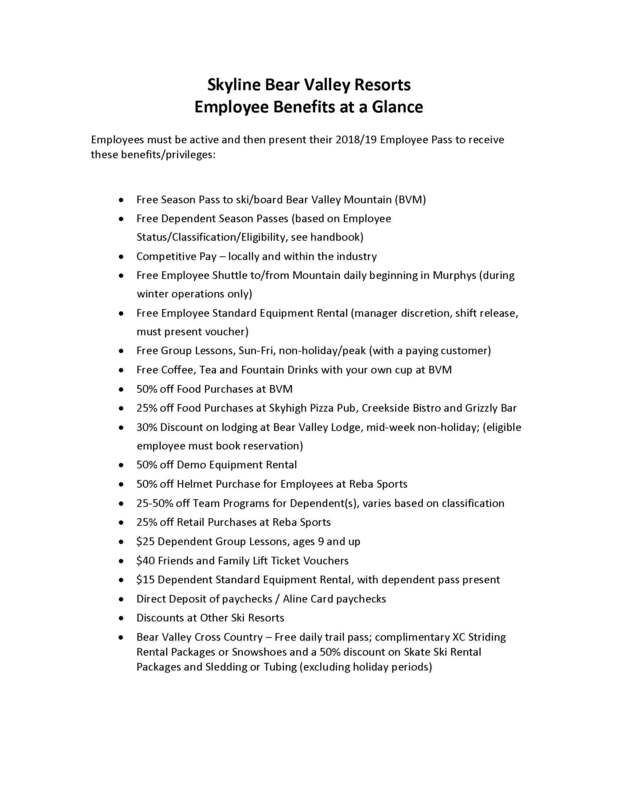 You will get paid every 2 weeks, on Sundays during the season, or Thursdays in the off-season for year-round employees. Bear Valley encourages employees to take adventage of direct deposit. You can have your pay check directly deposited into your bank account, and this option is highly recommended as the nearest banks are in Arnold (25mi/40km away). Just bring a voided check to HR and your check will be deposited within 2 pay periods. What else is there to do at BV? Bear Valley is a small alpine village offering restaurants and pubs, a general store, sport shop and snowmobile center. During the winter months, most activities around the village are geared toward snow sports, whether cross-country skiing, snowshoeing or snowmobiling. Although Bear Valley does not offer up the same nightlife opportunities as Lake Tahoe (like casinos or large nightclubs), Bear Valley’s local population is sure to keep you entertained. Often live music or movie nights in the Village pubs, a monthly book club meets at the local library, there's weekly yoga classes, and there are often daytime activities happening at the mountain. Within just over an hour’s drive are world-class golf courses, wine tasting, movie theaters, bowling alleys and Indian Casinos. Throughout the season Bear Valley also offers destination trips to places like Lake Tahoe and Yosemite. There is currently no public transportation available between Arnold and Bear Valley. Bear Valley offers an employee shuttle with stops in Murphys, Avery, Arnold, Dorrington, Camp Connell and Bear Valley. Calaveras Transit offers public transportation between Arnold and outlying areas like Murphys, Angels Camp and Sonora. If you are an international and plan to purchase a vehicle while you are here, you must have a valid international license.